Kahauale‘a Kahauale‘a can be found on the gentle slopes of Kilauea; site of much recent volcanic activity. Montane and lowland wet forests, a lowland mesic forest, and successional communities are represented. The largest population of Adenophorus periens, an endangered fern, is found in Kahauale‘a. Kipahoehoe This reserve is located on the narrow section of land running down the southwest slopes of Mauna Loa. The reserve protects a rare lowland dry grassland, as well as lowland dry and mesic forests, montane wet forests, montane and lowland lava tube ecosystems. Laupahoehoe Found on the northern slopes of Mauna Kea, in the cloud belt, Laupahoehoe is characterized by gentle to moderate slopes cut by young intermittent streams. The reserve contains lowland and montane wet ‘ohi‘a forests, small lakes, rare plants, and forest bird habitat. Manuka is the largest reserve in the State’s system. Extending from sea level to 5,000 feet elevation, it features a broad range of habitats, including: subalpine shrublands and forests, mesic montane kipuka forests, wet montane forests, lowland mesic and dry forests, and lava anchialine pools. Concentrations of the Hawaiian hoary bat can sometimes be seen from the trail that winds through the reserve. 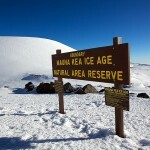 Mauna Kea Ice Age Located in the upper, southern flank of Mauna Kea, this reserve contains a rare alpine aeolian desert and the only alpine lake in Hawai‘i. Rare native invertebrates and evidence of Pleistocene glaciation can be found. The area also contains important cultural resources as it was once a Hawaiian adze quarry site. 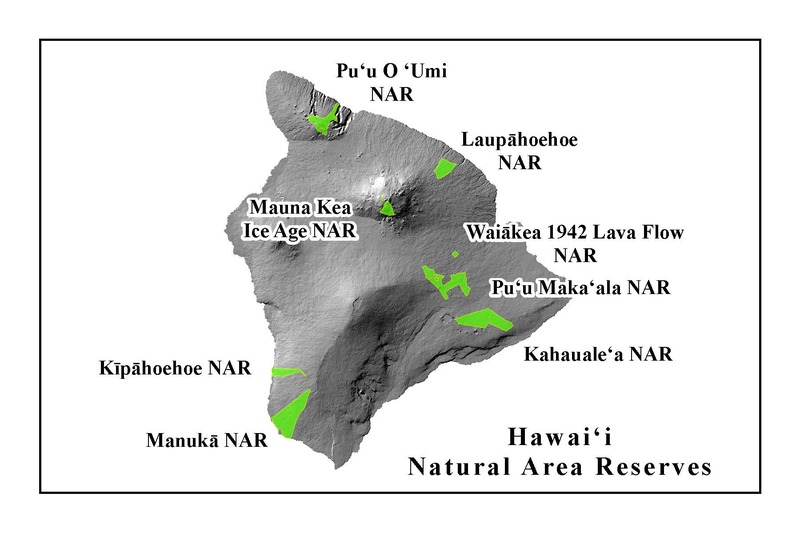 Pu‘u Maka‘ala Located on the gentle sloping eastern flank of Mauna Loa, Pu‘u Maka‘ala protects montane wet ‘ohi‘a and koa forests. A montane wet grassland ecosystem is also represented. The forest provides important habitat for some of Hawai‘i’s rarest birds, as well as several rare plants. Pu‘u O Umi This reserve covers the west upper slopes and summits of the Kohala Mountains down to the dry coastal sea cliffs. Two rare montane bogs are found at Pu‘u O ‘Umi, along with montane wet grasslands, shrublands and forests. The reserve also contains coastal dry shrublands and grasslands, intermittent stream and montane wet cliff ecosystems, and lowland wet forests and shrublands. Waiakea 1942 Lava Flow This reserve provides an example of a recent lava flow being colonized by ‘ohi‘a. Other successional communities in a montane wet ‘ohi‘a forest ecosystem are also represented. This reserve is located on the sloping northeast flank of Mauna Kea.